Our potatoes have done wonderfully well this year grown on the surface of the soil under a thick mulch. Instead of weeding and digging, we mowed the thick weeds, placed a tuber on the soil and covered with some mulch. As they grew we 'earthed' them up with grass cuttings, very thickly. Now as we 'dig' them, we just pick them up from under the mulch as the tubers are formed under the mulch. Clean and easy. Only thing to watch is that the mulch is thick enough to stop them going green from the light. I recommend this method to anyone who wants to avoid all the (unnecessary) hard work of conventional potato growing. Yield was almost as good as the conventionally planted ones. A 'bonus' I've noticed this morning harvesting the last ones is that there are literally dozens of tiny slow worms living under the straw. I've carefully drawn it back over them when I've discovered them. I hope this will make up for the ones I've hit with the mower when cutting grass! Now THAT is what I call very clever thinking. Great idea and would obviously save all us "back sufferers" ...and how much cleaner too. I will definitely adopt that method next year...as we say - we are always learning on GOY!! Thanks! Bertie, will that method work in containers also ? Seems like a lot less mess to use some compost on bottom of pail then the potatoes then some more compost then mulch? That's an interesting point, Lovegreen! You could be the first person to try it. 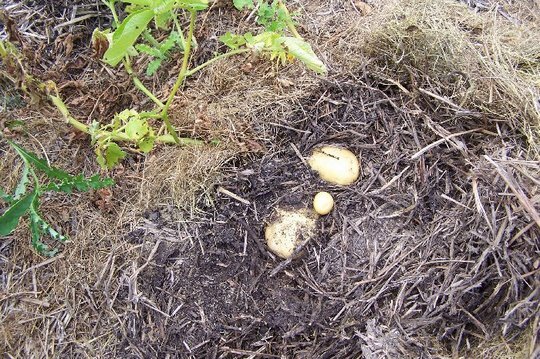 In principle, all that happens is that the potato plant roots down into the earth or compost, and the potatoes (which are swollen stems) form on the surface under the straw or mulch. I'd guess you'd succeed quite well with a large, deep container, as the deeper the mulch, the more potatoes you should get, in theory, if you 'earth' them up progressively with something like rotten straw. It could be a variation on the old potato barrel idea. I think I am going to try it next year. I'm getting so many new ideas from this website I can't wait until next year to restart my garden.